A stand-alone art school at a community college? “Get out! I couldn’t believe,” said Jen Detlefsen. But that’s exactly what she found in Tidewater Community College’s Visual Arts Center (VAC). The Navy veteran enjoyed drawing but never considered herself an artist. Her future crystallized when she discovered the art of glassblowing thanks to the Hot Shop on the roof of the VAC in Olde Town Portsmouth. The Visual Arts Center and TCC’s glassblowing program will take part in the 3 Ring Circus Demonstration and Performance Venue at the 2017 Glass Art Society Conference in Norfolk. The 3 Ring Circus will be located at 128 West Olney Road (between Glass Wheel Gallery and Work Release/Commune). Demonstrations and performances at the 3 Ring Circus are free and open to the public. Now in addition to being a mother and small business owner, Detlefsen has a solo show set for North Carolina this summer. As part of the Chrysler Museum’s highly competitive assistantship program, she spends a sizable amount of time each week honing her skills from top-flight visiting artists. Having graduated from TCC with an Associate of Applied Arts in Studio Arts with a Specialization in Glass in 2016, she was recently accepted into VCU’s prestigious art and design school, where she’ll pursue her bachelor’s in fine arts this fall. If that’s not enough, Detlefsen’s version of Disneyland comes to Norfolk starting May 31 when the Glass Art Society conference is in town for four days. TCC is a sponsor of the event, which includes demonstrations and performances. In essence, it’s a gathering of glass enthusiasts to showcase an art form that Detlefsen regards as alive. Detlefsen was a Navy diver in salvage and construction for the better part of six years, loving the adrenalin rush that accompanied that. Starting a family changed her path, and she turned to TCC, initially to dabble in classes to keep her mind active during the early months of motherhood. She enjoyed classes in history and real estate, but a trip to an Ohio glass exhibition piqued her interest in an art form she never considered. Meeting TCC Professor Julia Rogers at her inaugural glass class at the Chrysler, she learned about all the offerings at the VAC. She never imagined a community college was home to a rooftop Hot Shop for glassblowing and casting and a Cold Shop, for fusing, slumping and painting. Detlefsen’s versatile portfolio she submitted to VCU includes an award-winning cast glass and mixed media molding of her grandmother’s hands titled “Deeper Than Skin.” Created at the VAC, the piece won the Virginia Glass Guild’s Award of Excellence in 2016. Detlefsen’s exuberance for glass art spills over in discussing her “Lift Like a Princess” collection, on display through June 21 at the VAC’s “Breaking Barriers” exhibition. The decadent, meticulous work features a collection of hand weights and a bench, breathtakingly detailed. A Disney lover much like her daughters Matilda and Charlotte, she assembled a team of artists to help assemble the project, which includes hundreds of pieces of pink glass hand cut and copper foiled, each individually glued on to the work bench. 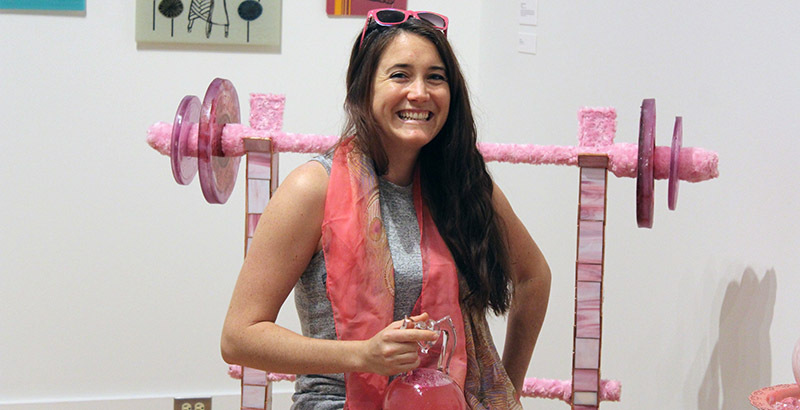 “Lift Like a Princess” will be the centerpiece of her show in August at The Carrack, an artist-centered community art space in Durham, N.C.
Detlefsen could have never imagined her evolution as an artist after making that first glass marble at the VAC just a few years ago.